This site started as the recipes from the box of Lillian Davis Goucher, born February 2, 1891. Her children Ruth, Bill, Hannah and Virginia and their children, grandchildren and other members of the extended family may be mentioned and contribute here. We no longer live around the corner from each other (or at least some of us don’t), but we can nonetheless connect through family traditions. Recipes (of course). Post directly, or send via the comment form or e-mail. Recipes from long ago and your family’s favorites from today are all welcome. Comments on the recipes posted here. Use the comment box to note your memories about a particular recipe or your experience with it here in the 21st century. Ratings of the recipes (just click on the stars below the recipe). Feel free to post a comment to explain the rating so we can understand how the rating system is being used — but if you just have time for a quick click that says “yes, I remember this,” that’s fine. Pictures. Links to albums you’ve posted elsewhere on the web, or pictures you’d like to upload here are fine. A few have been uploaded: see the photos category. 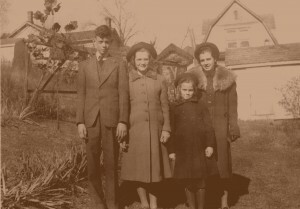 Links to websites that tell us more about the family. If you’ve got a site for your business, a Facebook profile, or anything in between, please consider sharing. Suggestions and help on the organization of the site itself — and if you have a better picture for the banner, please send it on! For more information or to get an account where you can create posts and upload files, please contact Nancy Shoemaker.